Sweet Treats by Sarah: 10% off at Dollar Tree Today! 10% off at Dollar Tree Today! 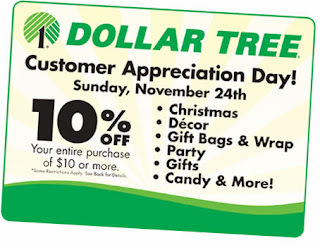 Go here to print your Dollar Tree Customer Appreciation Pass good for 10% off any purchase of $10.00 or more today (11/24) only!